Does anyone know where I can buy a rain barrel? -You can buy them at Home Depot and Menards. I believe they are $98 and $103. -On occasion groups sell them out of trucks in the parking lot of Dunham�s in East Lansing (on Michigan Ave near Frandoor). I know it sounds sketchy, but they�re legit. -In the Chicago area, the cheapest way in the Chicago Water Reclamation District rain barrel sale, which is usually twice a year. $48 last time I think. Can you eat plants(vegetables) that are watered from your roof? Rain barrels and rain gardens are great, but nothing here addresses the biggest problem I see with neighborhood water management -- lawns. Digging out grass and putting in garden areas increases drainage and reduces pollution from fossil fuel-using, noise pollution-contributing lawnmowers. And don�t get me started on the fertilizer homeowners dump on that grass all the time just to keep it thick! I�m nearing the point where my only grass is the paths between my garden areas. My little ecosystem attracts birds, butterflies and other wildlife. I�ve also learned that more garden means LESS work than maintaining a lawn. Face it, those of us without kids don�t need lawns for football. Lawns weren�t even commonly grown around homes until the 1920s or so, gardens were. We need to think differently about what is attractive around our homes! 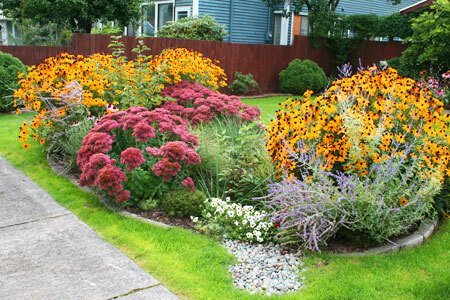 Here is an example of my rain garden I installed. -Beautiful garden jasher! You'll have to teach me how to post a photo.